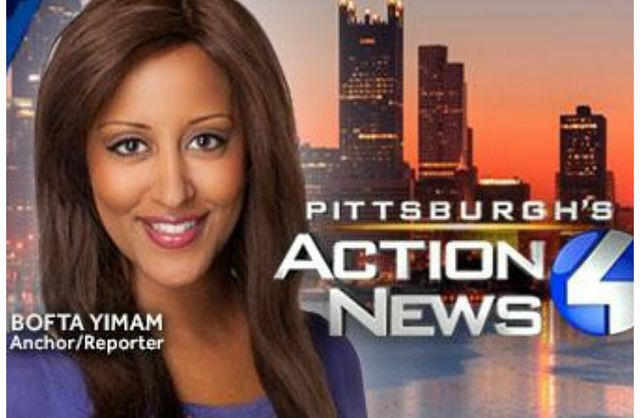 WTAE Channel 4 has promoted Ethiopian American journalist Bofta Yimam as its Weekend Morning Anchor. New York (TADIAS) — Investigative reporter Bofta Yimam, who won the 2013 Regional Emmy Award (Nashville/Mid-South Chapter) for excellence in the ‘Continuing Coverage’ category — while nominated for three awards overall by the National Academy of Television Arts & Sciences — has been promoted as Weekend Morning Anchor at Pittsburgh’s Action News 4 Television (WTAE). The network announced that Bofta’s new post commences on Saturday, January 30th, 2016. The Ethiopian American journalist, who is a native of Washington, D.C. and a graduate of University of Maryland, College Park, is also a recipient of several media professional awards including the 2011 Regional Edward R. Murrow Best Breaking News Story Award, the 2009 Regional Edward R. Murrow Award as part of “Crime and the City” coverage, and the 2008 Community Broadcasters Association Best Breaking News Story Award. Bofta went on to work at a cable station and at a CBS affiliate in Macon, Georgia before receiving three Regional Emmy nominations and winning one while working in Memphis.